'L. 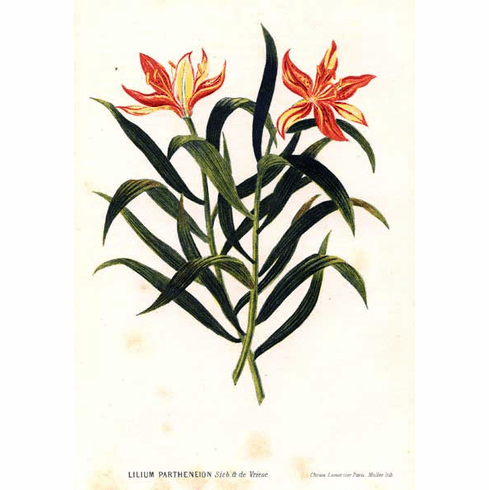 concolor var partheneion' is a variant of which virtually nothing is known. Described in his book 'A Guide for Collectors and Growers', author Ed McRae lists it as being discovered by "Baker 1871" but the only illustration we were able to uncover was a botanical print dated 1855-1856. �Nissen BBI 2089;�Great flower books�p. 80; Stafleu & Cowan 16.422; Landwehr 210. �1855-1856. All mentions of this subspecies are virtually identical - black spotted, red flowers with green and yellow streaks. There are many photos of var. partheneion on the web, but all are incorrect. We show the botanical print here as the best example of this variant.